I’m quite used to flying on long haul flights but my last journey from India was an eye-opener in many regard. For the first leg of my journey (Mumbai to Delhi), I was upgraded to Business Class, and I was treated to the hospitality and comfort that you would expect in an Executive Class in Boeing-777. The experience of the next leg of my journey (Delhi to Birmingham) proved to be a stark contrast to the first one. Although it was a Dreamliner, the horror of the entertainment system not working for a 9 hour flight, while seated in the middle seat of the middle column, greatly outweighed any positives; But as they say, bad luck makes good stories! So that inspired me to investigate some next-gen technologies that various aerospace companies are working on, which might shape our in-flight experience in future. 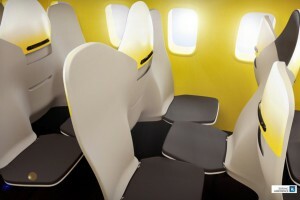 One such innovation which is tipped to hit the market within next 10 years is the windowless fuselage. Imagine yourself seated in a plane cruising at an altitude of 39,000 ft. and instead of those boring white panels all around, you are treated to a view of the outside world, as you would see if the fuselage were transparent. This is what The Centre for Process Innovation (CPI) is looking to achieve through flexible OLEDs. The entire inner surface of the fuselage (or selected sections) can be covered with thin high definition, flexible displays screens made from these OLEDs, thus allowing the screens to either be used as displays or for lighting. 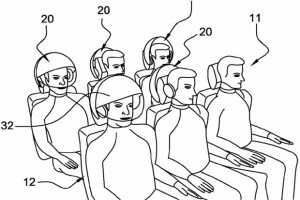 Airbus recently patented a design of Virtual Reality Helmets for its planes. As per the patent filing, the helmets offer the passengers sensorial isolation from external environment. If it’s really able to provide the sound, visual and/or olfactory isolation, as it claims, that would certainly redefine the whole flying experience! That said, it’s still in its preliminary stages of development and some experts claim that this is more of an Airbus’ strategy to protect its IP rather than bringing something very new to the market. Even if it does become a reality someday, if you still end up being the unlucky one whose helmet isn’t working, you might feel like you are trapped in a plane full of robots with no one to talk to! Something which really caught my attention in recent times was an Airbus patent on detachable cabins. Essentially, the fuselage of the plane will have a void at its core where the whole “cabin module” could be slotted in. Thus the passengers won’t board the plane itself, but instead the passengers and luggage would be loaded in the cabin module while the aircraft might not even have been parked yet! This would not only significantly reduce the a passenger’s waiting time at the departure lounge, it would significantly reduce an aircraft’s immobilization time, thus making it an extremely interesting prospect in financial terms. Another food for thought regarding this invention, which the patent doesn’t talk about, would be the possibility of incorporating an ejection mechanism for the cabin module in case of emergencies. It certainly would be extremely challenging to develop a mechanism to safely bring down the cabin module to ground, but it certainly could be a ground-breaking invention in terms of passenger safety! It’s not all nice and rosy when it comes to next-gen technologies though. Some of the recent ideas and patents regarding seating configurations could give you nightmares about flying on an aircraft again! Take for instance the HD31 Project from a French aerospace company called Zodiac. For every two passengers facing forwards, one is facing backwards. Now imagine this in a packed economy class environment and it won’t take you long to realize how excruciatingly annoying this can be! If you thought a seating arrangement of 3-4-3 for a twin isle aircraft was a bit tight, Airbus recently came up with an idea of cramming up another seat in each row! Just imagine yourself seated in the middle of the 5-seat column for a long haul flight and having to pass in front of your neighbours to go the wash-room! It remains to be seen which of these prospects actually come into practice in future, but it’s pretty safe to assume that our whole in-flight experience would undergo some massive changes in next 2-3 decades. In the meantime, as they would say on an Air India flight, let us “sit back and enjoy”..
Explosive bubbles: Is it really the future of subsonic flow control? This blog is produced by the members of the multi-disciplinary INNOVATE research team at the Institute for Aerospace Technology (IAT). INNOVATE is an EC-funded Marie Curie Innovative Doctoral Programme, enabling 13 researchers to develop a range of novel aerospace technologies for integration into a vision of a future air transport system. Here the team discuss their research, ranging from propulsion systems to navigation, and their experiences of life in Nottingham. Is air traffic optimisation really that important?